The main campus of TU Dresden is located south of the city centre and can easily be reached by bus and tram. If you are looking for a specific institute or would like to help visitors find their way, the maps of the most important TU Dresden locations might be useful for you (you can view the maps or print out the PDFs). To find the individual maps, simply go to the overview of campus maps. For detailed information about individual buildings, the Campus Navigator - TU Dresden’s interactive orientation system – has (almost) all the answers. You can also take a virtual walk across the campus. 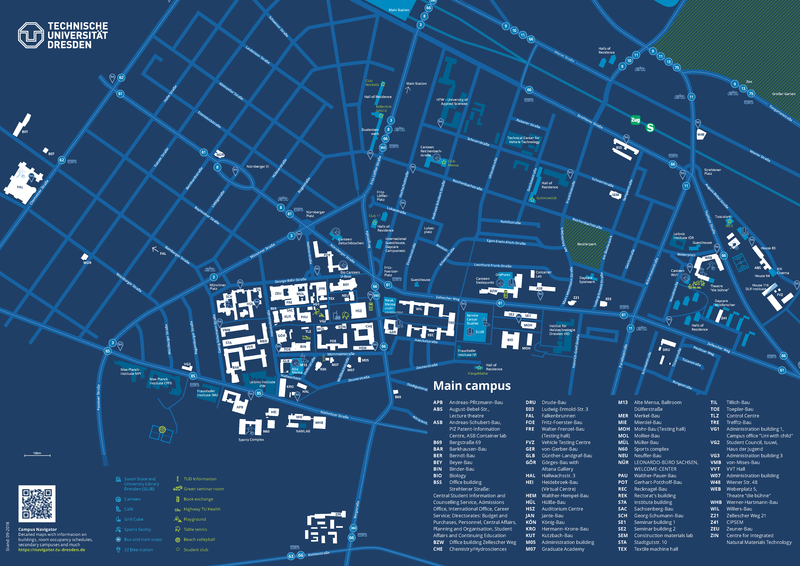 Find an overview of the TU Dresden campus and a selection of detailed maps below. These are up-to-date as of October 2018. Also, refer to the TUD-Campus Navigator. 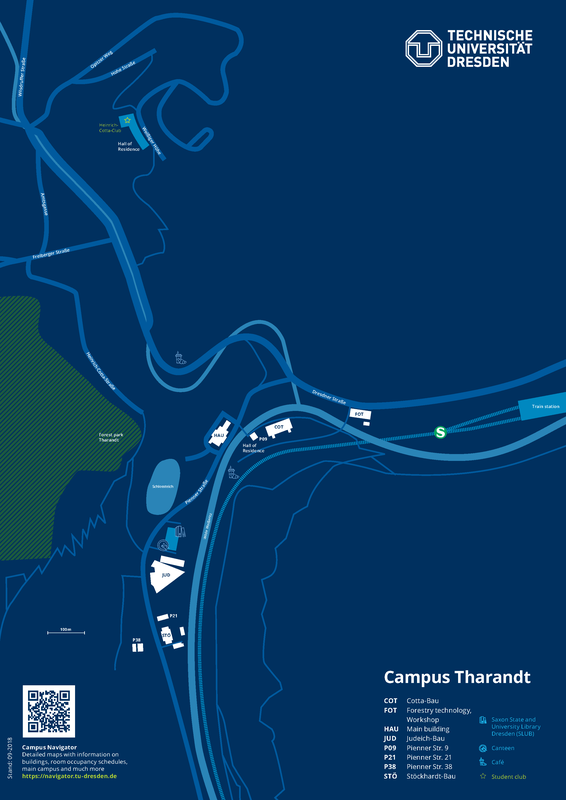 This map gives you a general overview of the main campus and TU Dresden’s other campuses in the city and the Dresden area. This map contains the major central facilities as well as the majority of TU Dresden’s faculties. 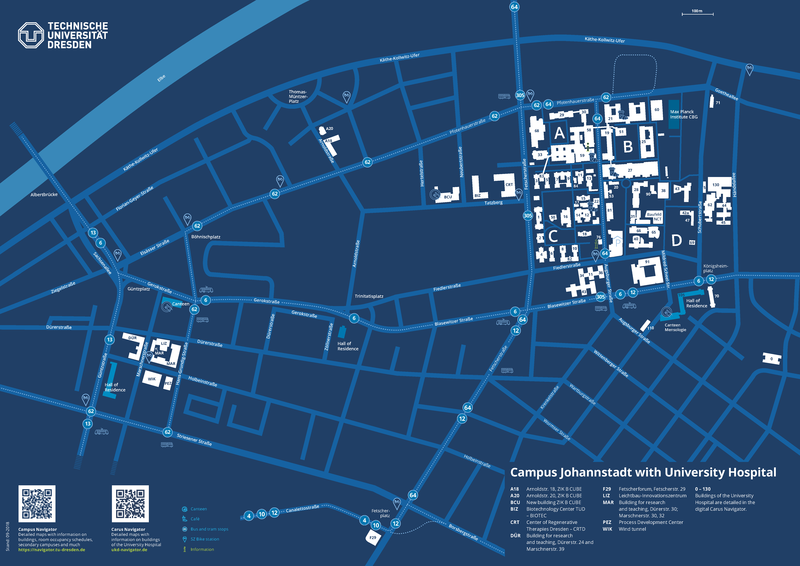 This map offers a detailed view of the University Hospital buildings in the city quarter of Blasewitz as well as university sites in Dresden’s Johannstadt. Here, you can find a map of the Tharandt Botanic Garden and Arboretum and the departments of forest sciences and hydrosciences. Use a free service, such as www.verkehrsmittelvergleich.de, to compare transportation options (car, inexpensive train specials, cheap flights, rideshares, buses, taxis and local public transportation). Another useful tool for those travelling by bicycle iswww.komoot.de.